How is your Christmas shopping going? Stuck for the perfect gift? 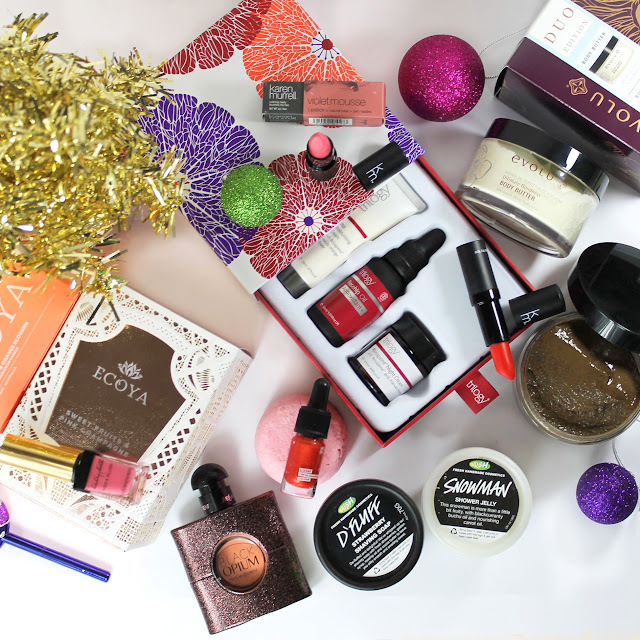 Here I have a selection of ideas specially selected with mums in mind so if you're looking to pamper your mum this Christmas look no further. Ecoya Candles. I've been fangirling over Ecoya candles since I finally tried their Vanilla Bean scent earlier in the year and now there's no going back! Pictured are my two current obsessions, White Peach & Orange Blossom along with Sweet Fruits & Pink Champagne, both limited edition scents that are an absolute must for anyone who loves their candles ultra sweet and fruity. They have an amazing scent throw and the beautiful, chic packaging is the perfect cherry on top. Sweet Fruits & Pink Champagne has actually been so popular that it's already sold out at a lot of Ecoya stockists, but I was able to find it at Lluma, Kitchen Kapers and Moi On George (all NZ based stores). White Peach & Orange Blossom is available at Recreate Yourself and my local Living & Giving (Lower Hutt) just restocked it too. I'm contemplating backing up Sweet Fruits & Pink Champagne, it's just that good! YSL Kiss & Blush is one of my favourite 'on the go' products to quickly dab on lips and cheeks and that gorgeous gold topped packaging will make your mum feel very spoilt indeed! The shade shown is Rose Libre, a pretty and flattering pink which I've swatched & reviewed here and it's available from selected department stores in NZ or for international shoppers on Fresh Fragrances & Cosmetics, Amazon, and Ebay . YSL Black Opium EDT isn't just a beauty in the bottle, it's a rich, warm fragrance that is sophisticated and gorgeous but still familiar enough to be a crowdpleaser. Equally perfect for the perfume buff or a special treat for someone who doesn't spoil themselves enough! I've reviewed it here. Available at selected department stores nationwide. LUSH.... well, anything! Walking into a LUSH store is the adult equivalent of a kid in a candy store, an overwhelming, exhilarating melange of colours, scents and textures. A few ideas for starters, as pictured: the Melting Marshmallow Moment Bath Melt, Emotional Brilliance - Power (classic red with metallic golden sheen for lips or cheeks), D'Fluff (a life changing shaving cream for sensitive skin which smells like strawberries and cream, reviewed here) and Snowman Shower Jelly (because who wouldn't love a sweet scented wobbly wee Snowman to wash up with!). As usual, there's also a wonderful assortment of gift sets available, which you can check out on the NZ site, along with a list of store locations, here. Trilogy Rosapene Beauty Collection. Trilogy's range is fantastic for lots of different skin types, which is great as it takes the detective work out of figuring out your mum's skin type (and I can tell you from experience that just selecting products targeted at aging skin does not go down well). This set contains a full size bottle of Trilogy's famous rosehip oil, plus minis of their Rosapene Night Cream and Vital Moisturising Cream. I haven't yet tried all of these as I have a lot of skincare to test at the moment but you can find plenty of other Trilogy reviews here. Trilogy products are available from selected Farmers, pharmacy, department and health stores nationwide. Karen Murrell Lipsticks. This homegrown brand is must have for anyone looking for a cruelty free pop of colour, they have an emphasis on natural ingredients (their byline is 'nothing nasty touches my lips') and eco-conscious packaging. Along with the lovely gift sets they've released this year, there are lots of single shades to choose from and no duds in the range. For some colour inspo head on over to my Karen Murrell archive of posts. Karen Murrell Lipsticks are available at selected pharmacies and health food stores nationwide. Evolu Duo Edition. This gorgeous set contains full size tubs of Evolu's Invigorating Body Scrub (the coffee scrub trend goes luxe!) and Ultimate Goodness Body Butter. I'm a big fan of the body butter's refreshing pear scent and it does a wonderful job of hydrating too. The duo set is $54.99 while each product has an individual RRP of $34.99 so it's a great way to save a bit of money on buying products separately. The packaging is so pretty it hardly needs gift wrapping!